As of February 17, 2016, the Registrant had 20,773,073 shares of Common Stock outstanding. If we are unable to maintain the effectiveness of our internal controls, our financial results may not be accurately reported. due or are converted, and the payment of that interest will reduce our net income. The sale of the 2019 Convertible Senior Notes may also affect our earnings per share figures, as accounting procedures require that we include in our calculation of earnings per share the number of shares of our common stock into which the 2019 Convertible Senior Notes are convertible. The 2019 Convertible Senior Notes may be converted, under the conditions and at the premium specified in the 2019 Convertible Senior Notes, into cash and shares of our common stock, if any (subject to our right to pay cash in lieu of all or a portion of such shares). If shares of our common stock are issued to the holders of the 2019 Convertible Senior Notes upon conversion, there will be dilution to our shareholders equity. Upon the occurrence of certain circumstances, holders of the 2019 Convertible Senior Notes may require us to purchase all or a portion of their notes for cash, which may require the use of a substantial amount of cash. If such cash is not available, we may be required to sell other assets or enter into alternate financing arrangements at terms that may or may not be desirable. The existence of the 2019 Convertible Senior Notes and the obligations that we incurred by issuing them may restrict our ability to take advantage of certain future opportunities, such as engaging in future debt or equity financing activities. On January 7, 2016, we received a paragraph IV certification from Par Sterile Products, LLC, a subsidiary of Par Pharmaceuticals, Inc., or Par, advising us that it had filed an ANDA with the FDA seeking approval to market a generic version of Merck’s NOXAFIL-IV product. The paragraph IV certification states it is Par’s position that Merck’s U.S. Patent No. 9,023,790 related to NOXAFIL-IV and our U.S. Patent No. 8,410,077 related to Captisol are invalid and/or will not be infringed by Par’s manufacture, use or sale of the product for which the ANDA was submitted. On February 19, 2016, Merck filed an action against Par in the United States District Court for the District of New Jersey, asserting that Par’s manufacture, use or sale of the product for which the ANDA was submitted would infringe Merck’s U.S. Patent No. 9,023,790. The case against Par is captioned Merck Sharpe & Dohme Corp. v. Par Sterile Products, LLC, Par Pharmaceuticals, Inc., Par Pharmaceutical Companies, Inc., and Par Pharmaceutical Holdings, Inc., No.16-cv-00948. Total revenues for 2015 were $71.9 million compared to $64.5 million in 2014 and $49.0 million in 2013. Our income from continuing operations for 2015 was $257.3 million, or $12.12 per diluted share, compared to income from continuing operations of $12.0 million in 2014, or $0.56 per diluted share, and net income from continuing operations of $8.8 million, or $0.43 per diluted share, in 2013. We recorded an income tax benefit of $219.6 million for the year ended December 31, 2015 compared to an income tax expense from continuing operations of $0.4 million for the year ended December 31, 2014 and an income tax expense of $0.4 million for the year ended December 31, 2013. The income tax benefit for the year ended December 31, 2015 is primarily the result of releasing a valuation allowance against a significant portion of our deferred tax assets. The tax benefit is primarily comprised of U.S. federal and state net operating loss carryforwards, tax credits, and other temporary differences. We had net income of $257.3 million for the year ended December 31, 2015. At December 31, 2015, our accumulated deficit was $402.0 million and we had working capital of $194.7 million with long-term convertible debt of $205.4 million. We believe that our currently available funds, cash generated from operations as well as existing sources of and access to financing will be sufficient to fund our anticipated operating, capital requirements and debt service requirement. We expect to build cash in the future as we continue to generate significant cash flow from royalty, license and milestone revenue and Captisol material sales primarily driven by continued increases in Promacta and Kyprolis sales, recent product approvals and regulatory developments, as well as revenue from anticipated new licenses and milestones. In addition, we anticipate that our liquidity needs can be met through other sources, including sales of marketable securities, borrowings through commercial paper and/or syndicated credit facilities and access to other domestic and foreign debt markets and equity markets. The cash provided in 2015 reflects net income of $254.9 million and $214.0 million of non-cash items to reconcile the net income to net cash used in operations. These reconciling items primarily reflect a net deferred tax asset of $219.6 million from the release of our valuation allowance, a $28.2 million gain on deconsolidation of Viking, and a $2.6 million gain on the sale of investments. Partially offsetting non-cash change in estimated value of contingent liabilities of $5.0 million, $5.1 million loss on equity investment of Viking, depreciation and amortization of $2.6 million, stock-based compensation of $12.5 million, amortization of debt discount and issuance fees of $10.3 million, and a decrease in the fair value of the Viking convertible note of $0.8 million. The cash provided by operations in 2015 is further impacted by changes in operating assets and liabilities due primarily to a decrease in accounts receivable of $6.5 million and a decrease in restricted cash of $1.3 million. Partially offsetting, other assets increased $0.3 million, accounts payable and accrued liabilities decreased $4.0 million, deferred revenue decreased $2.2 million and inventory increased $0.4 million. 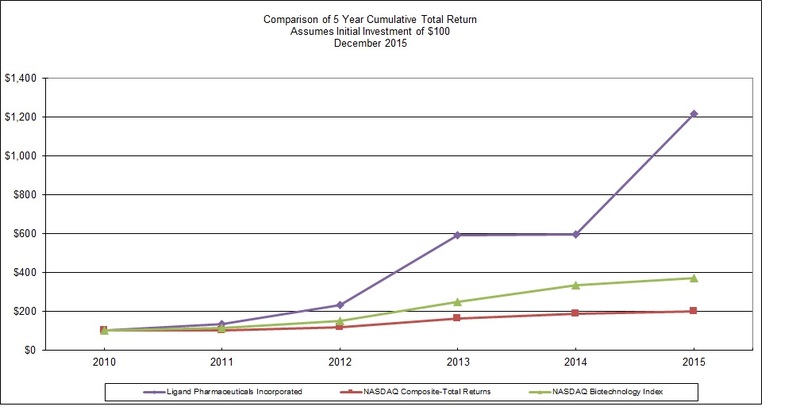 We have audited the accompanying consolidated balance sheets of Ligand Pharmaceuticals Incorporated (the “Company”) as of December 31, 2015 and 2014, and the related consolidated statements of operations, comprehensive income (loss), stockholders’ equity (deficit), and cash flows for each of the three years in the period ended December 31, 2015. These financial statements are the responsibility of the Company’s management. Our responsibility is to express an opinion on these financial statements based on our audits. We also have audited, in accordance with the standards of the Public Company Accounting Oversight Board (United States), the Company’s internal control over financial reporting as of December 31, 2015, based on criteria established in the 2013 Internal Control-Integrated Framework issued by the Committee of Sponsoring Organizations of the Treadway Commission (COSO), and our report dated February 26, 2016 expressed an unqualified opinion.